Is there really a separation? The right to freedom of religion is so central to American democracy that it was enshrined in the First Amendment to the Constitution along with other fundamental rights such as freedom of speech and freedom of the press. 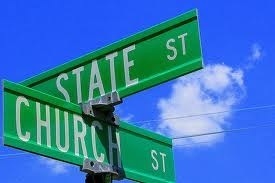 We are not supposed to establish a state run church/mosque/synagogue. Period. In order to protect this vital separation, churches were added to section 501C3 of the tax code in 1954. They could not participate in politics AND enjoy a tax-exempt status. We can thank Sen. Lyndon B. Johnson for that. Johnson was no ally of the church. Senator Johnson had it in mind to silence the church and eliminate the significant influence the church had always had on shaping “public policy.” To ensure equality among religious and non-religious alike, this was as important a legislative act as the Civil Rights Act. 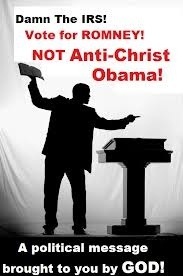 He intended to keep religious leaders from directly engaging in our political process from their pulpits. Unfortunately, the religious right seized their opening to influence policy directly with the Moral Majority. The Reagan Administration ushered in these frightening right wing Christian megalomaniacs who literally took control of his social agenda. They brought us hate mongers like Jerry Falwell and Pat Robertson who had tremendous impact on government who were not paying one red cent in taxes for their opulent and excessive wealth, while imposing their “standards of decency” on the entire nation. To add a dash of effrontery seldom seen; reverends, pastors and preachers plan on voicing their political opinions this Sunday. This is the impetus for Pulpit Freedom Sunday set to occur nationwide on October 7th. The lawyer for the Alliance Defending Freedom organization states: “The purpose is to make sure that the pastor -and not the IRS -decides what is said from the pulpit.” – Erik Stanley. It heralds a complete lack of respect for the fundamentals of the United States Government. If you want a voice in the political arena, you must pay your taxes like the rest of us Americans do. That keeps us from becoming a theocracy much like Saudi Arabia. If we don’t keep these zealots in check, that might very well mirror the Religious-Right America of the future. This is the third annual “Pulpit Freedom Sunday”. Isn’t it odd how this began after the first Black President was elected, as it was not an issue prior to that, apparently? Anyone with their eyes open can see this as just another not-so-thinly veiled display of blatant racism against President Obama. These agents of “god” are planning to videotape their sermons and then mail them to the IRS. Speaking of racists, the Mormon Church has very publicly funded efforts to define marriage as between one man and one woman by aggressively promoting Proposition 8 legislation. Ironic how they value the “one woman” principle as even today, open polygamist Mormons can be found in rural areas of Nevada, Utah, Arizona and Texas. Willard Romney’s great grandfather, Miles Park Romney had FIVE wives. We’ve obviously not successfully conquered separation of church and state as there’s still under God in our Pledge of Allegiance and In God We Trust on our currency. When a public official is sworn in or one testifies in court, they must place their hand on a book of fiction, the Bible. I sincerely hope THIS Pulpit Freedom Sunday results in the very warranted taxation of many of these profitable mega churches. Religious institutions certainly have had their fair share of scandals that deem them undeserving of their 501C3 status. In addition to their often deplorable behavior, they seem to favor Draconian Old Testament laws that have no place in modern society. Bigotry and discrimination should not be legislated through the pulpit without payment. Just imagine the funds we could put into educating our children if we taxed the $30 billion in holdings by the LDS Church alone. If only…. If you’d like to help stop this, please sign my petition to eliminate tax-free status given to these hate merchants! Click on this link to add your name! Thank you. The very freedoms we fight for are being challenged all the time by religious institutions pressuring the rest of free society to join in lock step like zombies who have frequented the tainted wells of mind altering hallucinogens. I wonder, just how many Americans were paying attention to the statement during the first debate regarding the tweaking of Social Security for all of those under the age of sixty? Perhaps to Mr. Romney, just a minor detail. It would seem that the element of time was of more importance to the mediator. Well the painting that Mr. Romney embellishes with his ever growing broad brush of vagueness has had the desired affect of leaving me rather troubled as to what the future has in store for us. One might think that this topic would garner a little more than an odd shrug of the shoulders and the demand to move on to more important matters. I for one point this out in order to establish the fact as I see it, that I, and my concerns regarding my future retirement are nothing but minor details to his Campaign, and his vision for the future. Sorry Mr. Romney, but I am more than a minor detail. More than just a number within the 99%. And as you will see in the comming weeks. More than just one vote, or one voice. The roar to follow! The religious right keeps raising it’s head into politics. How much will in impact? Maybe just enough to change the outcome in a few key elections. Jessie, I’ve used this as a link to provide info. The United Brotherhood of Carpenters and Joiners of America, Carpenters Local 1780, and the Southwest Regional District Council of Carpenters. Our local number 1780 used to be a seperate district council that enjoyed a solid financial footing until we were taken over by the California Carpenters through their affiliation with the national Carpenters President Doug McCarron who came thru the ranks in California. We were told that we would be given a vote on wether or not we wished to band together with the surrounding southwestern states to form a regional district council. We voted it down seeing that it was Vegas that had the lions share of the work at the time and felt that monies generated here would be diverted to suffering state coffers. The national council went ahead dispite our voteing this down, as a result we have lost our eye care and dental care, our premiums have sky rocketed, and the level of care is horrible. The regional council only has one person to field calls pertaining to your healthcare and this person travels between Vegas and L.A. You never can get a hold of anyone when you need questions answered etc. In the meantime the Carpenters administrators official answer to the problem of having lost our eyecare and dental is that we no longer have enough Carpenters working to support this level of care, yet a Carpenter loses his benifits after six months of being out of work so I dont see how they can affect everyone else’s coverage as we all have our own bank of hours contributing. Also the National office has seen fit to build Business Agents training facilities that are like resorts. The training facility here in Vegas only a few years old is going thru a major expantion currently to the tune of millions of dollars, and they are building a similar facility in Colorado where they only have a 2% market share. Well with all of this money being spent you might think that they would ask the Carpenters that support it all, how we feel about these investments as we continue to loose all the benifits that we have allocated a great deal of our raises to. You might find it interesting as I do that Mr. McCarron appointed his brother as the National Financil Officer, and that the former president of the local 1780 district council is married into the family. Another funny thing is that while our local sends out recomendations for voteing that favored all Democratic candidates our union steward at GES along with all of the General foreman, Foreman, and Leadman are diehard Tea party supporters that wear the yellow don’t tread on me T-Shirts and can’t stand any of the Democratic candidates. Now our Union Steward is appointed by GES not the Carpenters, we do not have a say in who represents us in shop. This union steward has been made a vice president of the local and is poised to become the next Buisness Agent / President of our local. This all stinks to higher levels than anyone working under the supposed umbrella of protection generally offered through collective bargaining and if anyone could provide reasoning or sense of any of this, Please do so.